As the Paris climate change agreement was being put together, debated, and finalized in December 2015, it was becoming increasingly clear that cities would be an important, if not essential, factor in whether nations could meet their greenhouse gas reduction targets. And for most countries, increasing — and greening — public transport services are an integral part of cities’ plans. That thinking was no different in the U.S., as cities and states began preparing their plans to meet targets agreed to in Paris by the American delegation. The onus on state and city strategies became even greater this year, when the new administration announced its intention to withdraw from the accord just after President Trump was inaugurated in January and confirmed in June. As more and more cities announced their plans to keep the Paris commitments despite the president’s decision, that also meant public transportation agencies would be asked to help more. To be sure, many of the decisions that were taken were in the works before Trump was sworn in. But the pace of adoption of climate change goals that were compatible with Paris clearly increased. It was clear that many cities and states were preparing to resist many of the new administration’s policies, ranging from health care to criminal justice reform to immigration, and of course, on the environment. After all, he campaigned on reversing many of those that were either supported or enabled by his predecessor. Perhaps even more than all others except immigration, climate change became a central focus of dispute. Caught in the middle of it all has been public transportation. 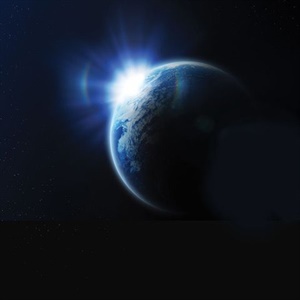 The industry’s transition to zero emissions and a greater share of the commute market are viewed by advocates as central to achieve the Paris Agreement’s goal of limiting carbon emissions to a level that would cause at most a two-degree Celsius rise of average global temperatures. On the other side are those in Trump’s leadership team who think that neither transit nor limiting mankind’s contribution to climate change is important; indeed, many of them, such as Office of Management and Budget Director Mick Mulvaney, view both the agreement and transit funding as wasteful and unnecessary impediments to economic growth and prosperity. Former New York City Mayor Michael Bloomberg with Executive Secretary of the UN Framework Convention on Climate Change Christiana Figueres and Paris Deputy Mayor Patrick Klugman. Photo via Compact of Mayors. Under the terms of the December 2015 Paris Agreement, the U.S. can’t fully withdraw until Nov. 4, 2020 — one day after the next presidential election. That means that the next president could decide to rejoin the agreement if Trump doesn’t win a second term, which almost guarantees that it will be an issue in the next mid-term Congressional and presidential elections. In addition, the U.S. can’t even legally notify the United Nations that it is withdrawing until 2019. Not only a rising chorus of cities and states, but also private industry and nonprofit institutions are making commitments to meet the core tenets of the Paris climate agreement on their own. The We Are Still In coalition includes signatures from over 125 cities, nine states, 183 colleges and universities, as well as more than 900 businesses (20 of which are Fortune 500 companies). The U.S. Climate Alliance is backed by 12 states and Puerto Rico. 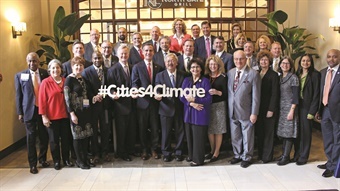 At least 369 U.S. mayors, representing 67.5 million Americans, have now adopted the historic agreement, as part of the Climate Mayors agreement, including the 10 largest cities in America — New York, Los Angeles, Chicago, Houston, Philadelphia, Phoenix, San Antonio, San Diego, Dallas, and San Jose — in both red and blue states. It wasn’t the first action to oppose the Administration on environmental issues. The Climate Mayors group had previously announced in March that they would not enforce an executive order that rolled back the Obama Administration’s policies to regulate energy production and reduce emissions. It has also joined lawsuits blocking the federal action. Within the same month as Trump’s July announcement, California Gov. Jerry Brown and former New York City Mayor Michael Bloomberg launched America’s Pledge on climate change, a new initiative to compile and quantify the actions of states, cities, and businesses in the U.S. to drive down their greenhouse-gas emissions consistent with the goals of the Paris Agreement. Building on the We Are Still In momentum, the America’s Pledge initiative will compile the announced commitments of all non-federal governments and organizations (known as “non-Party actors” by the United Nations Climate Convention), which will be summarized in a report that will track progress toward meeting the U.S. goals articulated in December 2015, how close the U.S. is coming to the nation’s original Paris agreement commitments, and what will recommend what else needs to be done — presumably without the federal government. “In the U.S., emission levels are determined far more by cities, states, and businesses than they are by our federal government — and each of these groups is taking action because it’s in their own best interest,” said Bloomberg in making the America’s Pledge announcement. 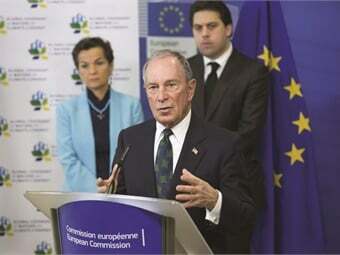 Bloomberg has also been appointed the United Nations Secretary General’s Special Envoy for Cities and Climate Change. For his part, Brown was also recently named the U.N. Special Advisor for States and Regions ahead of the United Nations’ 23rd Conference of the Parties the Framework Convention on Climate Change (COP23) that will be convened in Bonn, Germany. Brown and Bloomberg have enlisted the Rocky Mountain Institute and the World Resources Institute, which will provide the analytical effort tracking progress toward the America’s Pledge goals. Other stakeholders are said to be announced later this year. The first of the progress reports is due in November, Brown and Bloomberg note, in time for the COP 23 meeting to be hosted by the Government of Fiji in Bonn, Germany. 37% of California’s greenhouse-gas emissions comes from transportation. Transportation is the Golden State’s largest source of greenhouse gas, according to the state’s Air Resources Board. Under Paris, the U.S. Nationally Determined Contribution is a 26% to 28% reduction in greenhouse gases from 2005 levels by 2025. In addition, the America’s Pledge will devise and circulate a game plan for raising the bar and expanding the map when it comes to non-Party actors driving down U.S. emissions. This set of options, which will highlight the significant levers available to states, cities, and businesses to further reduce U.S. emissions, will hopefully serve as a game plan for meeting the U.S. reduction targets under the Paris Agreement. California Gov. 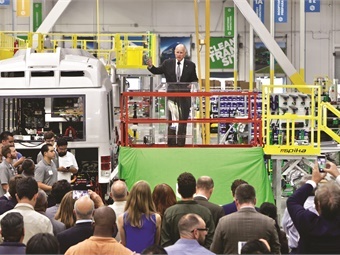 Jerry Brown discussed clean air policy during the commemoration of Proterra’s new electric bus manufacturing facility in Los Angeles County in July 2017. Photo courtesy of Proterra and Dominic Bolton. By the year 2020, when the first round of longterm plans are due from countries participating on the Paris Agreement, the International Urban Transport Union (UITP) projects that more than half of carbon emissions could be reduced by “the combined impact of second-generation biofuel, traffic flow, shifts to public transportation, and ecodriving measures.” For most countries, the emphasis in that sentence is a mode shift to public transport. While some believe that boosting public transportation’s role will be outstripped by the rapid growth of ride hailing services, the early returns do support that assumption. Most state and city officials believe that at the very least, public transportation will continue to play a significant role in reducing transportation-related greenhouse emissions. 139,000 metric-tons carbon dioxide emissions could be reduced annually in New York City over the next 25 years, with the use of transit or rideshare vehicles. Still, some public transportation agencies are looking to expand transit use by creating rideshare-like public transportation options, whether expanding fixedroute and on-demand services or embracing “microtransit” concepts. At the Los Angeles County Metropolitan Transportation Authority, officials at the new Office of Extraordinary Innovation have announced the beginning of a new demand-driven, microtransit strategy, which started with an industry forum to discuss technologies and strategies that can addresses the needs and changed expectations of riders while leveraging existing fixed-route services. From the forum, Metro officials hope that new partnerships and services will be born. These officials are betting that some new combination of mobile phones, sensors and GPS tracking, traffic data feeds, data analytics, and mapping software can put more transit or transit-like options at commuter’s fingertips to help them reduce auto trips — whether by additional walking or biking, taking more bus, train, and ferry trips or hailing more shared rides — by aiding more convenient multimodal combinations that are quickest and cheapest. It’s estimated that if such info-tech-enabled, demand-driven transit could facilitate 30% of New York City’s trips, the total number of vehicle miles travelled would be reduced by 52 million trips annually. Such a reduction would also contribute mightily to relieve congestion on New York City’s streets, with 14 million hours in delay saved in a single year. It would also save the city $959 million on road repairs and reconstruction over 25 years. And for its part toward the U.S. Paris agreement goals? More such trips on transit or shared-ride vehicles could mean an annual reduction of 139,000 metrictons of carbon dioxide emissions. The second way in which public transportation is being asked to help meet Paris goals at the local level is by converting bus fleets to all-electric vehicles. In just 2017 alone, three METRO Top 100 transit bus fleets have announced commitments to converting their entire fleets to electric buses. The largest such commitment, by Los Angeles’ Metro, was announced in July — and Paris was on the mind of many of its board members during its board motion on the commitment. “As the federal government moves backward, here in Los Angeles, we are moving forward,” said Los Angeles city councilman and Metro director Mike Bonin regarding the board vote. His agency has the second-most bus riders in the country, and is the third-largest public transportation system by ridership. Many of the nation’s other larger public transportation agencies, including those in Philadelphia, New York City, and Chicago, are eyeing the Los Angeles move, as well as similar commitments by Seattle’s King County Metro and Southern California’s Foothill Transit. All of these agencies have also begun testing smaller orders of electric buses. Although much of the funding for such buses has come from federal sources, including the FTA’s Low Emission/Zero Emission Bus Program, more money is also being committed by non-federal sources to these actions. A new report from the U.S. PIRG Education Fund estimates that $2.9 billion from the recent Volkswagen lawsuit settlement will be directed to states to help fund transportation infrastructure, and the report strongly recommends using the money to purchase electric vehicle fast-charging stations for highways along with an aggressive expansion of all-electric transit buses. According to the terms of the VW settlement, supplemented by a second settlement agreement, agreed to by VW and the Department of Justice, VW will pay a total of up to $22 billion in damages for their role in violating federal clean air laws by selling more than half-a-million vehicles with its “clean diesel” marketing that actually emitted up to 40-times the legal limit of dangerous NOx pollution. At least 369 U.S. mayors, including those pictured here at a U.S. Conference of Mayors meeting, have adopted the Paris climate agreement. Photo via Compact of Mayors. The U.S. PIRG report recommends that states use the maximum allowable amount of EMT funds, 15%, on the purchase and installation of fast-charging stations for the state’s highways; but it also recommends that the remaining 85% of that trust fund be used to for grants to transit agencies to procure all-electric transit buses. To be sure, the announcement that the U.S. would eventually withdraw from the Paris agreement has to be seen as a setback for global efforts to combat climate change. Despite that move, however, others are joining forces to fill the breach. Public opinion polls continue to oppose U.S. withdrawal from the Paris agreement and support continued U.S. efforts to combat climate change. To what degree the gap in progress toward U.S. goals can be filled, and how soon, is uncertain at this point — the first real measure of progress not only in the U.S. but elsewhere, will be known in November at the COP 23 meeting in Germany. Thus far, however, the response to the July announcement has been encouraging, and transit can share in some of the credit.